Aoiyama is in the yusho race again, this time with the top guys present and (somewhat) in good form. Would be quite the upset to see him shove out Ichinojo today and have that second place spot all to himself going into the final days. With the makuuchi yusho race being anyone's game, I'm finding that threeway juryo yusho race a bit more interesting. Three wiry guys leading with 1 loss, and Enho's actually among them. That kid can really adapt, which is something not many rikishi are good at. Good to see Akatsu as the guest on Abema today as well! I've seen him on quite a few sumo programs, but I don't really know what he's about. If anyone could PM me more info on him, I'd much appreciate it. Kise's just hanging on by the skin of his teeth. It's incredible, the way he's managing to dodge a loss. 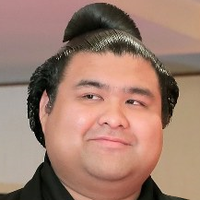 I love Takayasu's expression. "Oh crap, not again..."
My first sumo games yusho! This is truly an honor! I will gambarize and do my best to win back-to-back yusho in Nagoya. Arigatou gozaimashita! Such a nice poster! I wonder who the artist is. I'd like to have a print of that without the text.